Summary – Do I Recommend It? The DeLonghi Magnifica S ECAM 22.110.B is a small, entry-level super-automatic espresso machine. With a long name. 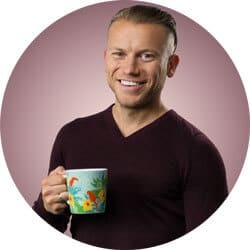 If you’re looking for general information and more reviews of super-automatic espresso machines, you can find all my reviews on the best espresso machines here. Small, sturdy and easy to clean. Because this machine doesn’t have some of the extra features found on other espresso machines, it has a slimmer profile. It doesn’t have a display, but this doesn’t seem to be a huge drawback when I compare it to similar models with displays. You won’t find any major stainless-steel components on this machine, but that’s also true for all super-automatic espresso machines in this price range. I especially like how I can specify the exact amount I need for an espresso, down to the milliliter. It’s a feature that even some really expensive machines don’t have. With this feature, I can make an espresso very similar to the kind you would get from a machine with a portafilter. The stainless-steel burr grinder has 13 settings, which is actually quite a lot for a super-automatic espresso machine. However, the two finest grinding settings don’t work very well — using grounds that fine either clogs up the machine or the espresso barely drips out. This is the machine’s biggest drawback. A high, adjustable spout for larger mugs. Quieter than the Magnifica ESAM 3000.B. The grinder becomes clogged when using very fine grinding settings. The cup tray isn’t heated. Unfortunately the videos below are only available in German. The DeLonghi Magnifica S ECAM 22.110.B is one of the least expensive super-automatic espresso machines on the market. Nevertheless, it’s worth doing a price comparison before buying. You can check the current Amazon.com price here. The advantage of buying online from a retailer like Amazon is that it’s easy to return items, and, in Germany, we even have a legally guaranteed 14-day return period. Retail stores usually aren’t obligated to take back items, even if you still have the product in its original packaging and you bought it just a few hours earlier. Buying a Used Model of the DeLonghi Magnifica S ECAM 22.110.B. There’s no consistent price on eBay for a used DeLonghi Magnifica S ECAM 22.110.B. However, I’d strongly discourage you from buying a used automatic espresso machine, especially one that is relatively inexpensive. When you buy a used espresso machine, you will never know what kind of mold or gunk you’ll find hiding under the casing. What’s more, if you’re buying one of these machines in the US, a new model often costs just slightly more than a used model. So I’d definitely recommend a new model, if you’re able to afford it. The DeLonghi Magnifica S ECAM 22.110.B has a “silver brother,” the DeLonghi Magnifica S ECAM 22.110.SB. The SB is basically an identical cappuccino maker, but it has a metallic, silver color. All the other technical specifications and possible settings are identical. You can check the current price for the silver model on Amazon.com. Another automatic espresso machine that’s in the same category as the DeLonghi Magnifica S ECAM 22.110.B is the DeLonghi Magnifica ESAM 3000.B. However, this espresso machine is significantly larger and louder. Otherwise, both machines are quite similar. You can download PDF instructions for the DeLonghi Magnifica S ECAM 22.110.B here, directly from the DeLonghi website. The manual is important because the different beverage buttons and settings aren’t necessarily very intuitive, and a glance at the manual will help you understand them. Because this cappuccino maker doesn’t have a display, using the machine isn’t necessarily foolproof, but overall it’s still quite easy to learn. The DeLonghi Magnifica S ECAM 22.110.B has a spout that can be set to different heights. At the tallest height, a mug around 5 inches (13 cm) tall can fit under the unit. That’s high enough to fit even a tall latte macchiato glass, with a bit of room to spare. The minimum height is a bit less than 3.5 inches (9 centimeters). Still, that height worked well even with my very short shot glasses, as you’ll see later in this article. This super-automatic espresso machine has a built-in stainless-steel burr grinder, which is noticeably quieter than the grinder on the DeLonghi Magnifica ESAM 3000.B. Still, I certainly would not say it is especially quiet. The grinder has 13 grind settings, although the two finest settings are essentially unusable. The fine grind either clogs the grinder or causes only a small amount of espresso to drip from the spout. Apparently neither the pump nor the grinder can handle the finest settings. This super-automatic espresso machine lets you install a water filter, which you can mount in the water tank. The water filter works similarly to a classic Britta water filter: It reduces the water hardness to Level 1 (see below). This means there’s less calcium in the water, which leaves less sediment in the machine. However, just because you use the filter, you still need to decalcify the DeLonghi Magnifica S ECAM 22.110.B. How Often Should I Decalcify? The hardness of the water you use determines how long the filter lasts. The harder the water, the quicker the filter becomes saturated with calcium carbonate. You can test your water hardness with the machine’s included testing strip, or you can check with your water company. If you already have soft water, you can probably use the machine without a filter. You can also filter your water with a normal Britta filter before using it in the machine. 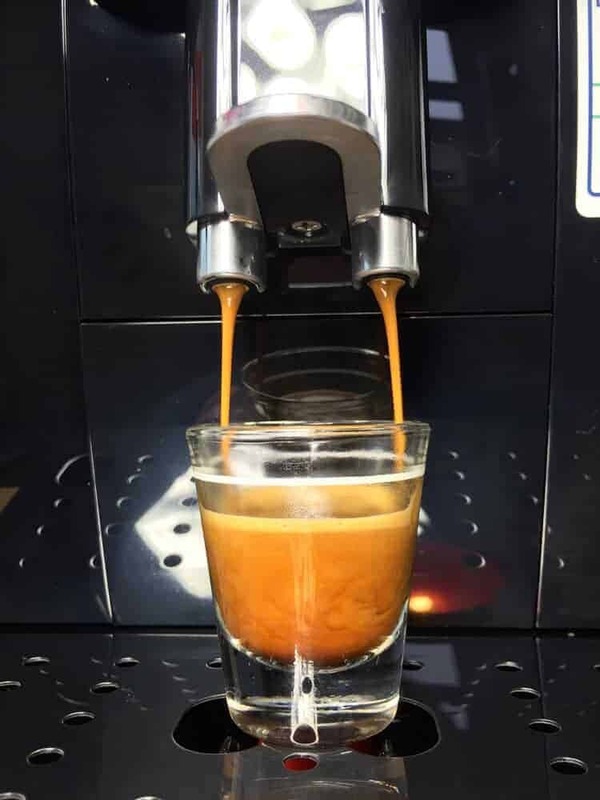 In any case, it’s definitely important to account for the hardness of the water that you use in the espresso machine, because the hardness will determine how often you need to decalcify the machine. Be aware that buying water filters also means more recurring costs. However, cheaper packs of filters are also available on Amazon. 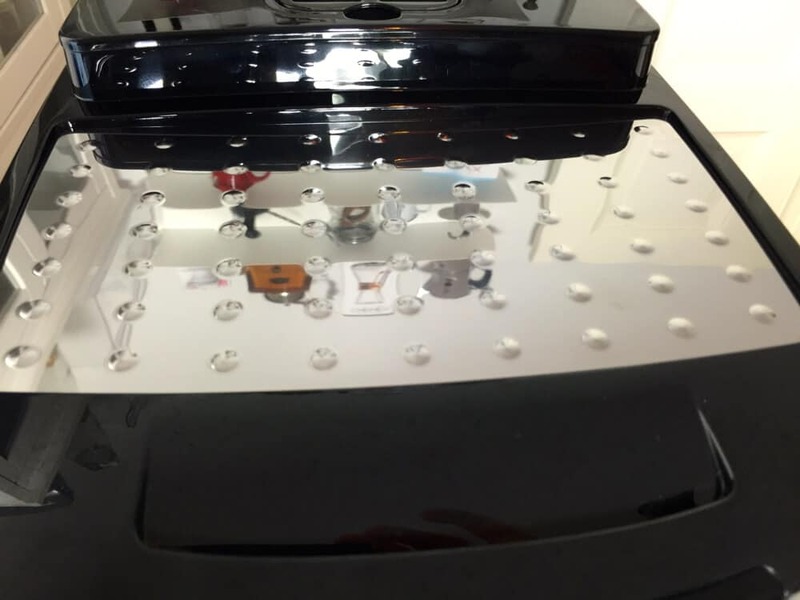 The entire tray unit can be fully removed from the front of the machine. The coffee grounds tray sits above the water catch tray. As you can see, both catch trays are relatively small. The red dot is a floating gauge that shows how full the tray is, so you know when to empty it. As is the case with so many latte machines, the bottoms of your favorite ceramic mugs will quickly scratch the stainless-steel cover of the drip tray. (At least it adds character.) Cleaning is quick and easy: simply rinse out all the parts with running water. Do not wash the parts in a dishwasher. Doing so will wear down the plastic parts over time. The maximum pump pressure is 15 bar. If you use the finest grinder settings, the pump will only manage to push single drops of water through the brewing unit. 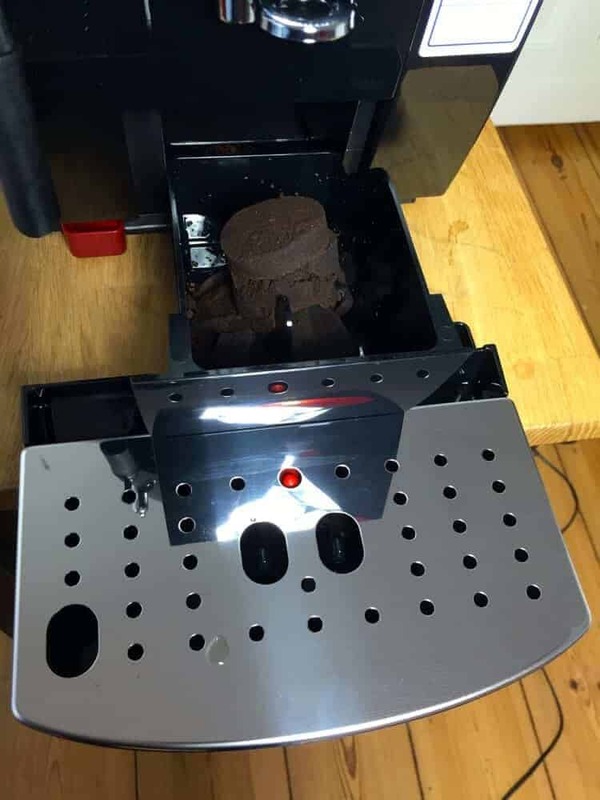 When I used similar grinding settings with the DeLonghi Magnifica ESAM 3000.B, it also got stuck. Additionally, the DeLonghi ECAM 23.420.SB had exactly the same problem, as that machine has the same parts. Despite this, it is still possible to make a respectable espresso. You just have to avoid using the finest grinder settings. 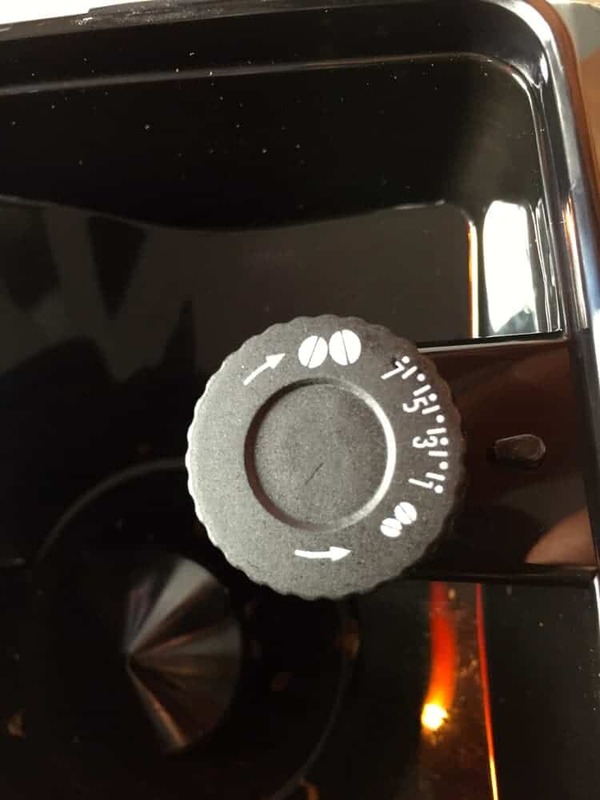 The steam wand on the DeLonghi Magnifica S ECAM 22.110.B is very simple. It only has one basic setting, whereas the steam wand on the somewhat more expensive DeLonghi ECAM 23.420.SB has two foam settings. Still, this doesn’t concern me, as I use only the basic setting for both machines. I find that the only downside to a simple wand is that it doesn’t necessarily look as nice. This machine’s steam wand is very similar to a steam wand on an espresso machine with a portafilter. With a bit of practice, you can make fine, uniform foam — you can also work on improving your latte art. Expensive machines like the Siemens EQ.6 have a “cappuccinatore” (an automatic frother) setting. This is often called a “one-touch” frothing system, or something similar. When using a one-touch frothing system, you just pour in the milk, and the rest is automatic. With the DeLonghi Magnifica S ECAM 22.110.B, though, you’ll have to depend on your own two hands to do the work. The cup tray is nice and shiny, but unfortunately it’s not heated. Because of that, however, the tray on this small machine does offer a lot of space, relatively speaking. The DeLonghi Magnifica S ECAM 22.110.B also has an additional compartment for pre-ground coffee. That compartment has direct contact with the brewing unit, though, which means that water can quickly accumulate there from steam. When the water combines with coffee grounds, it can quickly lead to mold. It’s therefore important to always keep this compartment clean. You can easily see the condensation on the lid. Of course, it’s best to use freshly ground coffee, and this automatic espresso machine can also do that. Still, someone might occasionally want to drink decaffeinated coffee. In that case, you can use this compartment. A measuring spoon comes with the machine. Despite the lids’ warning, you can actually try using about 1.5 scoops of ground coffee for an espresso. Even without a display, it’s quick and painless to set up and use the DeLonghi Magnifica S ECAM 22.110.B. Foaming the milk doesn’t require any wizardry, and the buttons are straightforward. Still, some of the settings aren’t that great, and you’ll need to adjust them. It’s especially important to specify the correct amount of coffee grounds for the machine to use. I think it’s great that the box includes a water filter because the larger – but mostly identical – ECAM 23.420.SB doesn’t include one. I didn’t count the included plastic measuring spoon, though, as I swapped it out for a different one right away. When using the machine, it’s important to remember that the finest grinder settings don’t work properly. The machine either doesn’t recognize that there are coffee beans, which means it won’t grind them, or the espresso doesn’t flow correctly and only drips slowly out of the machine. Both of these are signs that the pump is too weak to work with the finest grinder settings. By the way, many DeLonghi super-automatic espresso machines also apparently have difficulty handling the finest grinder settings. The DeLonghi Magnifica ESAM 3000.B couldn’t handle the finest settings when making an espresso, and the more expensive ECAM 23.420.SB also had the exact same problem. These machines all include the same components for their pumps, grinders and brewing units. The Yirga Santos blend from Coffee Circle is a great organic espresso for all automatic espresso machines, although it’s currently only available in Germany. It’s a blend of 75 percent Arabica and 25 percent Robusta beans, with great crema and aromas of chocolate and roasted nuts. This fresh espresso is shipped soon after roasting. It tastes good by itself, but you can also add milk to make an excellent cappuccino or latte macchiato. This espresso is low in acidity and very palatable. You can find my complete review of Yirga Santos here. Using the default settings will give you 40 milliliters (about 1.4 ounces) of espresso. I actually don’t understand this default setting, since every good coffee bar will serve an espresso between 20 and 25 milliliters (around 0.8 ounces). The DeLonghi Magnifica S ECAM 22.110.B can actually do that, too. A good thing about this automatic espresso machine is that you can select the exact amount of espresso you want, which lets you avoid watery or bitter coffee. The first thing you should do is to put the grinder on the finest setting that you can. Unfortunately, the machine doesn’t work correctly with the finest settings, so I eventually determined that “3” was the finest setting that I could use without any problems. With the lower settings, either the espresso wouldn’t flow correctly or the grinder wouldn’t pull in the espresso beans. My goal was to make an espresso that was around 20 milliliters (about 0.7 ounces), with a 25-second flow time. This shows an espresso with the finest setting I could use, but the amounts still need to be adjusted. This is what the result looked like. I was pleased with it. The flow time was a bit short, though. I could have adjusted that by using a finer grind setting, but that wouldn’t have worked because of the reasons I’ve already mentioned. Turn the knob clockwise to the strongest coffee amount setting. Hold down the brew button with the cup icon on it. The grinder will begin to grind the espresso. Hold the button until the light flashes, then let it go. The espresso will now begin flowing out of the spout. 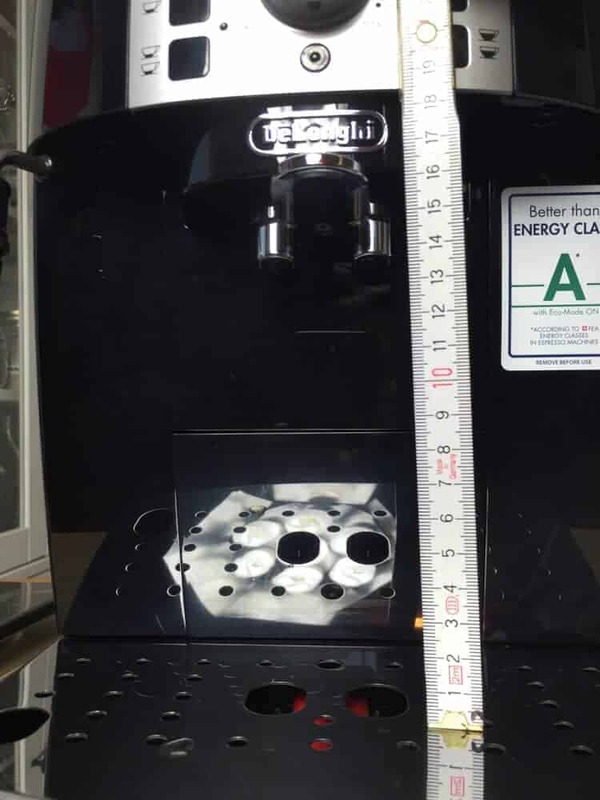 Until you get the hang of using the machine, you might want to use a shot glass to measure the amount of coffee coming out, or even use a scale to weigh it. 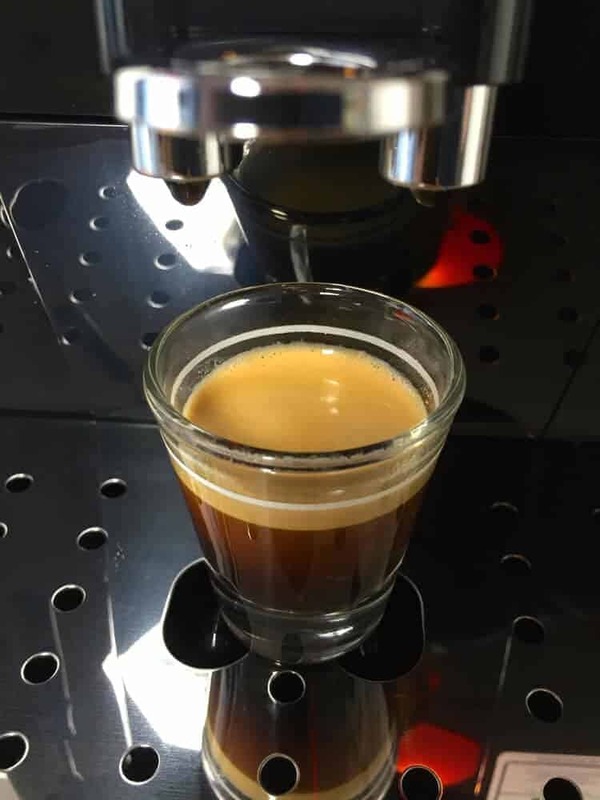 Either way, once 20 milliliters – nearly half of a 2-ounce shot glass – of espresso has come out, press the button again. You now have an espresso that’s worthy of its name. It took me a few attempts before I got the amounts right, so don’t give up if it doesn’t work on the first try. Is your espresso weak and watery? Or is the crema too milky, while the espresso tastes both watery and bitter at the same time? 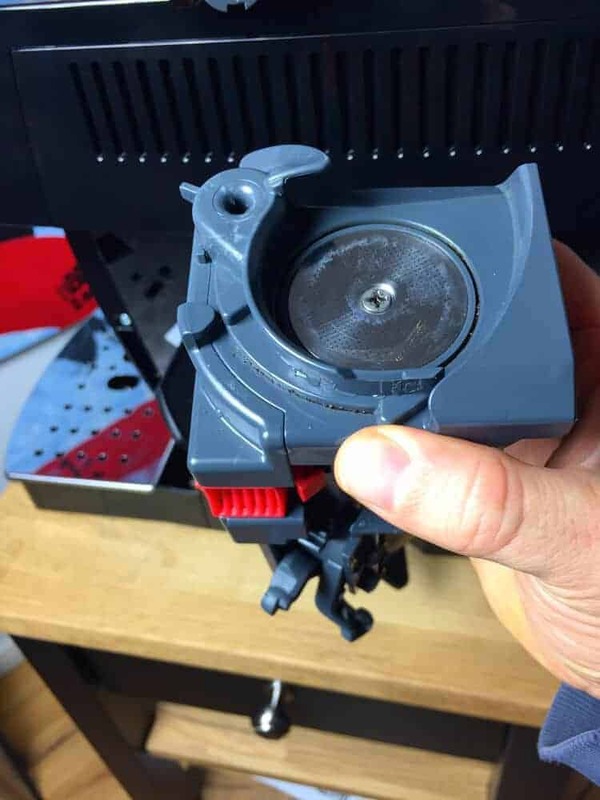 Here are a few ideas about how to deal with these problems when using the DeLonghi Magnifica S ECAM 22.110.B. The espresso is ground too coarsely. When this happens, the coffee grounds offer too little resistance and the water flows through it too quickly. Try setting the grinder at a finer setting. The espresso may be too old. You can find tips for making a proper espresso in my espresso reviews. If you don’t put good stuff into the machine’s top, then you can’t expect anything good to come out below. The water level is set too high, which over-extracts the espresso. See the instructions for making a good espresso. I wish there were an easy way to “read” the number of espressos you’ve made with this machine, even though it doesn’t have a display to tell you that information. I even found some instructions about how to do so, but none of them worked for me. It was definitely easier to see how many espressos I’d made when using the Magnifica ESAM 3000.B. 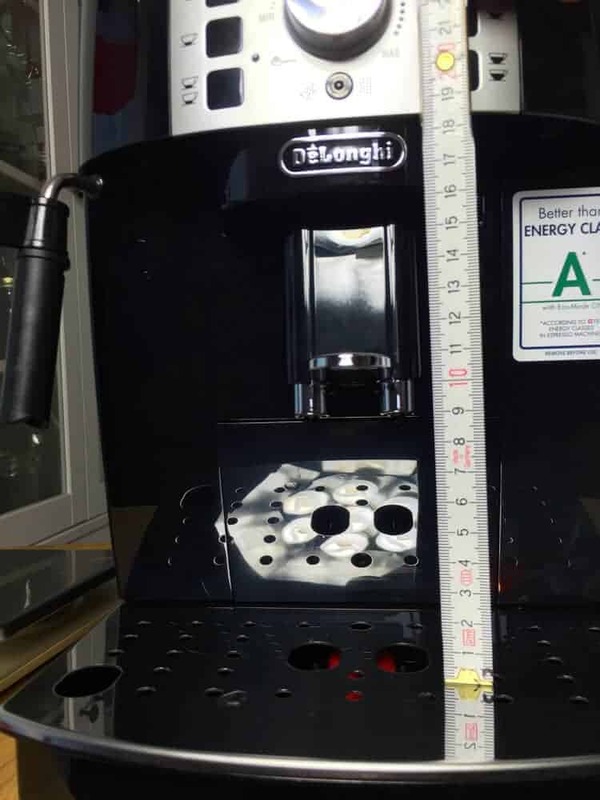 Knowing how many times you’ve used the machine is useful because you not only learn about your level of coffee addiction, but the machine warranty can even be dependent on the number of uses. The warranty is often good for two years, or for 5,000 to 6,000 uses. 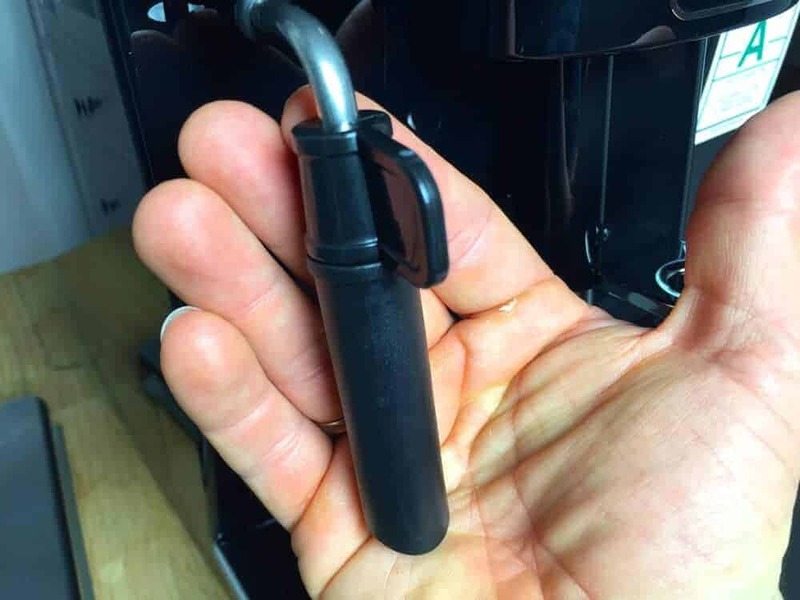 Anyone who wants their automatic espresso machine to last a long time needs to clean it thoroughly, and it’s especially important to clean it frequently. When I say “frequently,” I mean every day that you use it, ideally. People too often forget to remove and clean the brewing unit when cleaning. The combination of high humidity and used coffee grounds makes the brewing unit an ideal place for fungus to grow. I know a company in Berlin that even plants mushrooms in coffee grounds — don’t worry, though, it’s all legal! Mushrooms are tasty, but surely nobody wants mold or any kind of fungus to grow inside their DeLonghi Magnifica S ECAM 22.110.B! Having a removable brewing unit is a huge plus. That’s because a removable brewing unit is more hygienic, and it’s also good because it can be easily replaced if it’s defective. 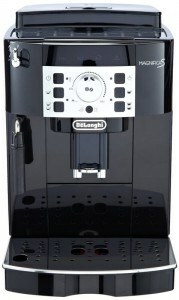 You can even buy a replacement brewing unit for the DeLonghi Magnifica S ECAM 22.110.B. Removing the brewing unit is super simple because of its tab behind the water tank. Simply pull on the tab to open it. Careful, though: Before removing the brewing unit, you must completely shut off the espresso machine. Otherwise, the brewing unit won’t be in standby position, and will remain clamped in, making the brewing unit impossible to remove. Be sure to turn off the machine using the power button on the front! The rest is simple. Just press the two red tabs together and simply pull out the brewing unit. Now you’ll have the brewing unit in your hands. You can clean the unit with a clean sponge and running water. If you have enough time, you can also let the brewing unit air-dry outside of the machine. You can use that time to open up the DeLonghi Magnifica S ECAM 22.110.B, letting it air out. I especially recommend doing this before going on vacation. Moisture trapped inside an automatic espresso machine can quickly turn it into a greenhouse. It’s certainly no fun to come back from your vacation to find all kinds of things have sprung to life inside your espresso machine. When you froth milk, a little bit of milk will remain inside the steam wand. This can be hard to remove, and can form a coating inside the wand. You should definitely prevent this from happening. It affects the taste of the milk, it’s unhygienic and the wand won’t work as well. Eventually, the wand can become completely clogged, blocking the flow of steam. After every use, get a sturdy, wet, clean cloth. Wrap the cloth around the wand and turn it on for a few moments, letting out a burst of steam. Careful when doing this, though, as the steam can burn you. Be sure to use the steam to blow the milk residue out of the wand before wiping it. It only takes a few seconds and will spare you from the unpleasant consequences of not cleaning the wand. Many people assume that, if you use a water filter, you don’t need to decalcify the machine. That’s incorrect, though. If you use a water filter, you still need to decalcify, but you can do it less often than you would without one. It’s therefore important to account for water hardness when using the DeLonghi Magnifica S ECAM 22.110.B, as it will determine how often you need to change the water filter. Additionally, if you’ve decided not to use a filter, that will determine how often you need to run the decalcifying program. Both parts should be cleaned regularly and thoroughly. It’s very simple to remove the water tank and coffee grounds tray from the front of the machine. They’re both surprisingly small, but I actually think this is an advantage because it means they need to be emptied and cleaned regularly. I don’t even want to think of how rarely I’d empty my trash can if it never got full. Please don’t put these parts in the dishwasher — the plastic parts will wear down over time. Although you can hand-wash the drip tray and the coffee grounds tray with a sponge and dish soap, I’d be more careful with the water tank. That needs a thorough washing with clean water, as well as time to dry out. After all, you don’t want coffee that tastes like soap. Nobody wants their crema to be made of soapsuds. I frequently read comments from people who get annoyed by automatic cleaning programs. Don’t be annoyed: Programs are your friends, and this is one you definitely shouldn’t skip. Even if you rinse out the brewing unit every day, it doesn’t mean that it’s completely clean inside. That’s why you need the cleaning program. It’s best to use this somewhat frequently — you’ll be rewarded with better-tasting espresso and your DeLonghi Magnifica S ECAM 22.110.B will be rewarded with a longer life. You open up the DeLonghi Magnifica S ECAM 22.110.B to remove the brewing unit, but apparently it’s stuck and won’t move. Please don’t reach for the crowbar! 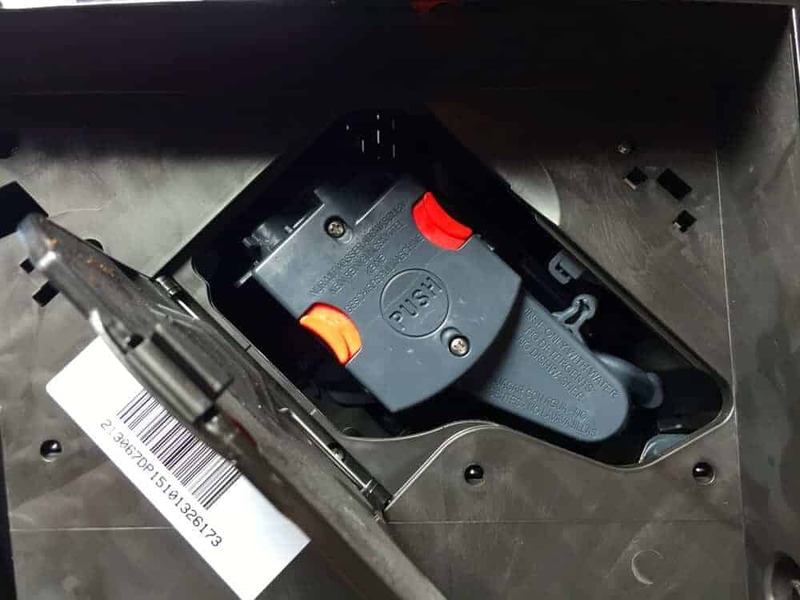 There’s a simple solution that doesn’t require any force or risk damaging the machine. If this happens, it’s likely just because you turned the machine off with the main switch, and it didn’t shut down correctly. The DeLonghi Magnifica S ECAM 22.110.B has a power switch in the front, as well as a main switch in the back. 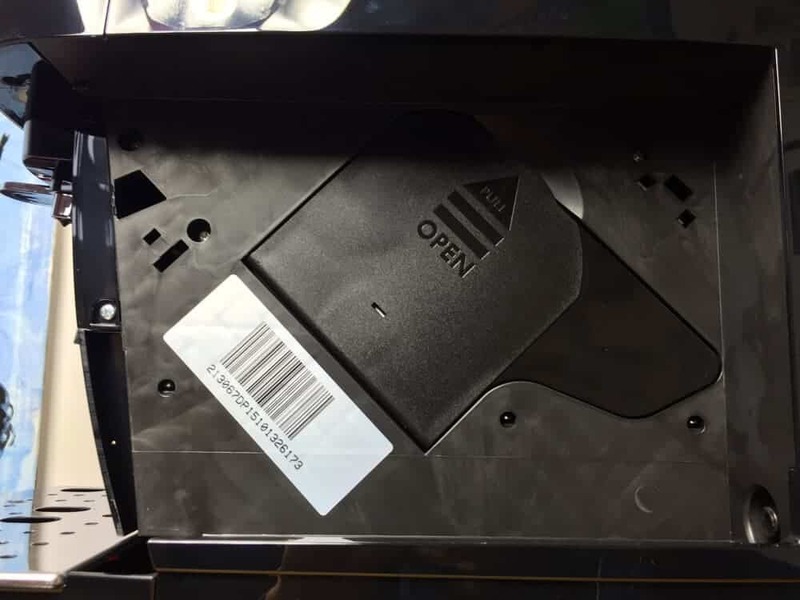 Its main switch immediately turns off the machine’s power. The disadvantage of using the main switch is that it doesn’t give the brewing unit time to go into standby mode, and the brewing unit is only removable when in standby. Turn on the power with the main switch. Using the front power switch, turn on the machine, then turn it off again. Wait until the machine stops making noise – now the brewing unit is in the correct position. You can now remove the brewing unit. All the seals on automatic espresso machines and coffee machines start to wear down over time. They gradually start to deteriorate, which can lead to leaky spots. You can notice this if you suddenly find water in a place in the machine where it shouldn’t be. For example, maybe the espresso is dripping from the wrong place, or the grounds are suddenly much damper than before. 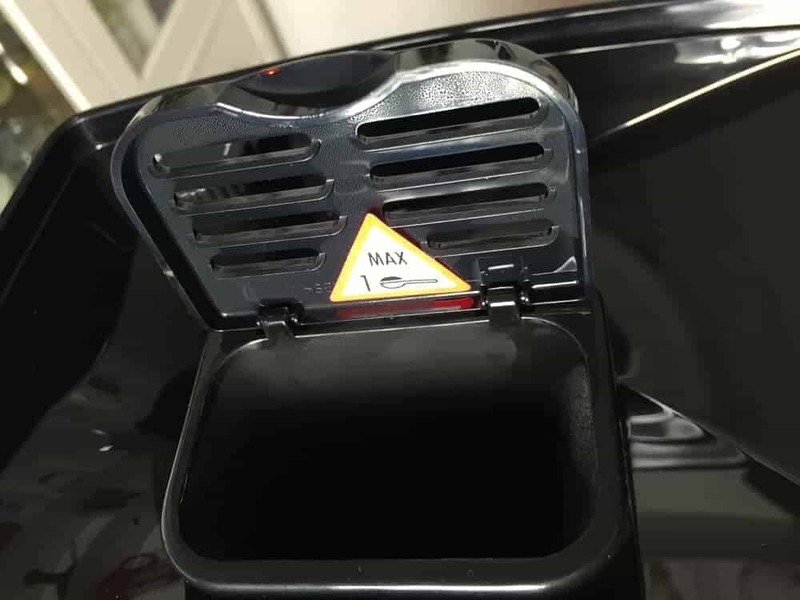 If so, you should replace the seals as soon as possible to avoid more problems with the DeLonghi Magnifica S ECAM 22.110.B. All seals last for a similar amount of time, so if I planned on changing one seal, I would simply replace all of them at the same time. The DeLonghi Magnifica S ECAM 22.110.B is a small automatic espresso machine that doesn’t take up much space. It’s one of the cheapest super-automatic espresso machines to come out lately. 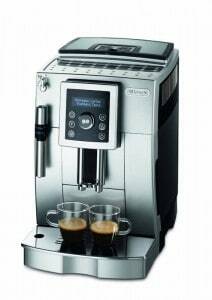 Its direct competitor is the Magnifica ESAM 3000.B, a DeLonghi old-timer that’s in the same price category. Based on my experience, if I had to decide between these two super-automatic espresso machines, I’d choose the DeLonghi Magnifica ECAM S 22.110.B. It wins in a head-to-head comparison. In particular, it’s much quieter and noticeably smaller. I especially liked that the DeLonghi Magnifica S ECAM 22.110.B lets you set the exact amounts you want for an espresso. That may seem obvious at first, but I’ve also tested many considerably more expensive automatic espresso machines that don’t let you do that. The removable brewing unit is another plus, although that’s becoming standard for machines from most manufacturers (not for Krups and Jura, however). It doesn’t have a display, but I didn’t really miss it. You also can’t get milk foam with the push of a button. You’ll have to consider how important that is to you, though, since automatic espresso machines with a built-in cappuccinatore milk frothing system are significantly more expensive. The biggest shortcoming of the DeLonghi Magnifica S ECAM 22.110 is the fact that its finest grinder settings are unusable. If you think that this super-automatic espresso machine is the right one for your kitchen, you can check the price on Amazon.com right here. Love your blog – you’re doing a great job! Just had a quick query for you. I am interested to purchase an entry-level bean to cup machine. The Delonghi ECAM 22.110 indeed looks really attractive. But I am also interested with the ESAM 4200 which I don’t believe you have reviewed yet. Which machine would you recommend between the two? Thanks for your comment. I find the Delonghi ECAM 22.110 much better. Thank you for all the detailed information! Would you recommend the Delonghi Magnifica S ECAM 22.110 or the Delonghi Dinamica? Is it worth the price difference? I didnt find a detailed review of the Delongi Dinamica in English , so that’s why I’m asking here. Thank you so much in advance. I really appreciate it. Also, which coffee beans do you recommend for these two machines? I live in Germany. Hi, I’m Arne. German barista and coffee aficionado. Hello dear visitors to my coffee blog. 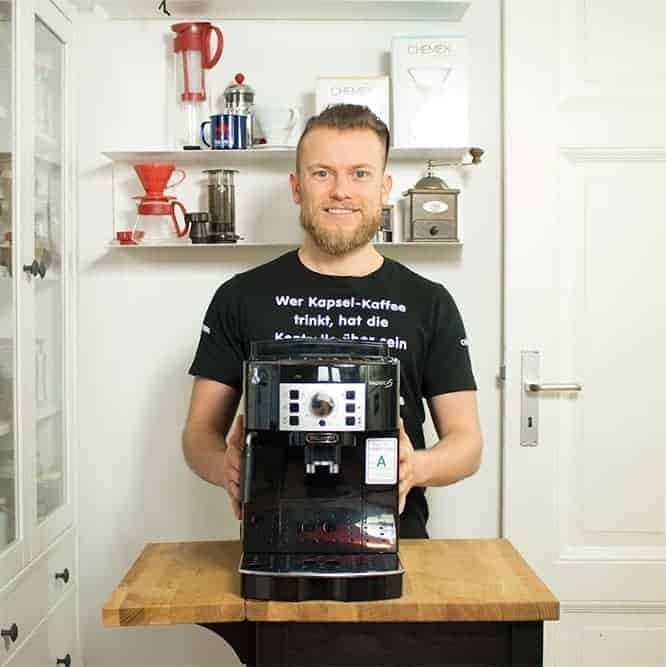 My name is Arne and I started writing about coffee in 2008 on the Barista blog. Originally, this website was completely in German. Due to the many requests, I have now started to translate some parts for you into English. My English is not perfect! There are certainly some mistakes and some German specific details. Still, I hope you enjoy reading and I’d love to hear your thoughts in the comments!